If you have an existing Java based application with a messaging architecture using JMS, how easily can you switch to using Azure ServiceBus? Well, it turns out that if the application is using the AMQP protocol, the switch can likely be done just via reconfiguration rather than changing the code. To make sure I didn’t start with a sample coming from the Microsoft documentation of how to do it I decided to start with the samples that comes with Apache ActiveMQ. If you download it from http://activemq.apache.org/ you will find a folder named examples where the Java version builds with Maven. In the bin folder you’ll find ways to start the ActiveMQ Broker on MacOS or Linux. Then you can run the sample code that sends and receives messages. mvn dependency:copy-dependencies mvn package ~/apache-activemq-5.14.3/bin/macosx/activemq console & mvn exec:java -Dexec.mainClass="Listener"
I’ve modified the sender/publisher code abit so that I can specify the queue, message and number of messages to send on the command line. String ConnectionURI = protocol + "://" + host + ":" + port + "/"
Running the sending code again with these environment variables set, I get the following output (in the IntelliJ IDEA debug console). 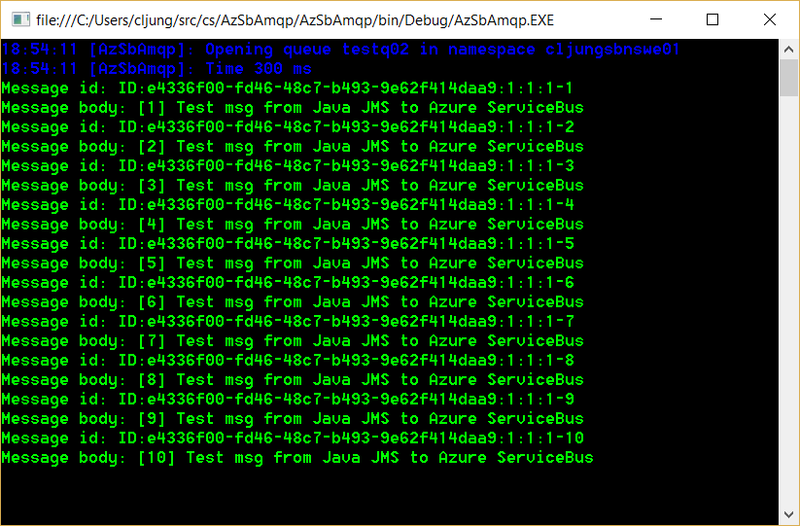 The listener/receiver of the ServiceBus queue is a little C# program I wrote to illustrate interoperability. The purpose of this blog post is to highlight that an existing Java application that uses JMS for it’s messaging handling do not need to be rewritten to start using ServiceBus as its backend broker. Java application can use many different techniques to find messaging resources, like JNDI, config files, etc, but whatever it is you probably can reconfig it to use Azure ServiceBus since ServiceBus supports the AMQP protocol. This gives you alot of options when rehosting a Java application to use public cloud, such as Azure.